Have you ever gotten on a Segway before? The feeling is totally something else for first timers, and that is a given. 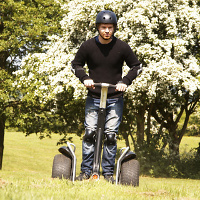 Well, for those who want to experience a Segway and more can always fork out £39.50 for the “Segway Rally Experience for Two” from Firebox. This special offer might just be the perfect gift for your dad and you, or perhaps for you and your partner, letting you go head to head with another person on a custom-built rally course. You will kick start the day with the basics being shared by a trained instructor. In that course, you will be able to pick up the relevant skills on how to handle obstacles, turn, stop, and most of all, go forward (as fast as the Segway can anyways). Once you have mastered the basics, you will be given the opportunity to let loose on the rally course as you attempt to clock up your best time. The entire experience is touted to last for up to half an hour, but chances are good you would do well to make an allowance of 90 minutes. Once you’re done, you will be on the receiving end of a certificate and a group photo.